What are the ethical ramifications of interviewing a former paramilitary or a victim of violence? Can the work of historians contribute to truth and reconciliation or a transitional peace process? What is the role of a historian in documenting trauma and should you share this testimony? What are the personal risks to the historian in listening to traumatic testimonies? These were some of the tough issues tackled by the Dangerous Oral Histories Conference on 28 and 29 June 2018. Held in Belfast at a time when there are more ‘peace walls’ dividing Protestant and Catholic communities than before the 1998 Good Friday Agreement, a lot of sessions covered how the memory of sectarian violence continues to ricochet through Northern Ireland today. There was a strong focus on voices drowned out in this conflict: often Nationalist or Unionist paramilitaries have been interviewed at the expense of testimony of women and children who bore the brunt of violence and are absent from many accounts. The Conference did not shy away from taboo subjects in survivor testimony. It brought attention to the pride and excitement many people felt in participating in conflict at a formative time in their youth; to the ‘hierarchies’ of suffering in Holocaust survivors such as children or members of the Kindertransport rescue who felt they ‘were lesser’ and had to defer to adult survivors of concentration camps when it came to discussions of what defines a holocaust survivor; to the ways in which paramilitary violence was brought into the home and inflicted on their own families; and to how overzealous university ethics committees can in fact prevent interviews with minority groups silencing their voice in research. Forgotten stories was also a key theme picked up by PHA members such as Anisa Puri who highlighted the crucial contribution that volunteers played in the response to the AIDS epidemic of the 1980s and early 1990s in Australia. Anisa investigated the ethics and challenges of recording oral history interviews that prompt the retelling of traumatic experiences and risk re-traumatisation. PHA Vic members Professor Alistair Thomson and Nikki Henningham looked respectively at testimonies of family and sexual violence in Australia and the shifting representations of these narratives in recent decades. The way in which oral history can be used to help understand our urban fabric and what we push to the fringe of our city was poignantly explored by Leyla Vural. She talked about the history of Hart Island in New York. The island has an eerie past used variously as a tuberculosis sanatorium, a Union Civil War Camp, a women’s insane asylum, and a boys’ reformatory. Today it is a potter’s field with over one million people, mostly homeless buried in mass, unmarked graves by inmates held in the city’s largest gaol. Leyla presented interviews with the inmates, homeless people and activists for the homeless who have fought for access to the island to mourn their friends. For Leyla the island represents a heterotopia, a space separate from society but one which acts as a mirror revealing how a city treats its disenfranchised, dead and poor citizens. Or as one inmate succinctly described a space– ‘where nobodies bury nobodies’. The Dangerous Oral Histories conference was hosted by the Oral History Society more information and links to journal articles can be found on the website. 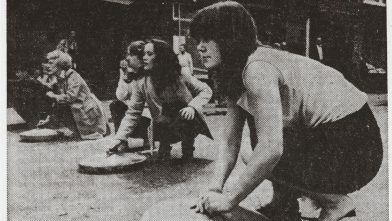 Image: Women banging out the news of the death of one of the Hunger Strikers, Thomas McElwee, with bin lids in a Nationalist neighbourhood of Belfast, c.1981 (Source: Unifax-UPI as reproduced by the Ulster Museum). Thanks Minna – this sounds like an extraordinary conference for practitioners, and illustrates the necessity both for considering the ethics of interviewing as well as the limits posed by ethics committees.